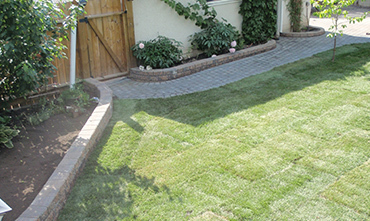 Modern Earth Landscaping Ltd offers a wide variety of landscape construction services to meet the requirements for your project. With the latest equipment available we can offer the most complete service to you rather than having to loose quality through sub-contractors and other companies. 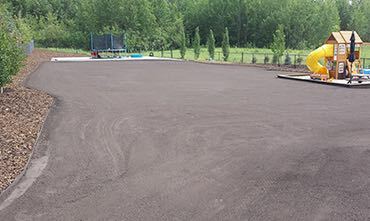 We have key contacts within the horticulture and landscape industry, such as nurseries, tree farms, turf farms, landscape yards, lumber yards and masonry and natural stone suppliers. 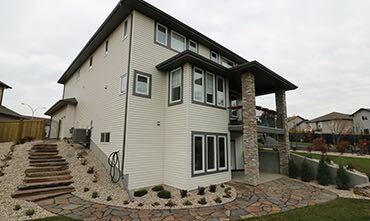 With a primary focus on professional landscape design and construction we also specialize in all types of stone work. All of our construction projects are designed to meet local regulations and requirements. Throughout the construction process we follow all current trade practices and overbuild well above minimum manufacturers specifications. From start to finish with initial consultation meeting, design concepts and project planning. 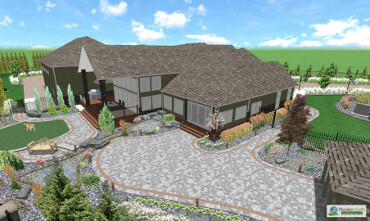 View your yard before it’s built in stunning Hi-RES 3D Imaging! 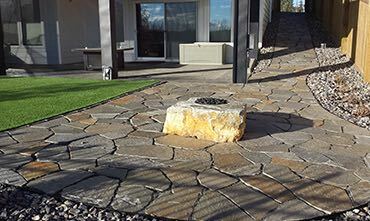 Take your Fire pit area to another level with a core drilled natural stone fire rock. No smell, smoke or wood required! 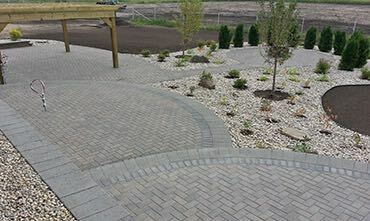 Choose natural flagstone for your pathways and patios. Giving more character than concrete or paving stone. An individual Feature Boulder or a yard full of them! We can lift, position and tweak the stone until your happy with it’s placement. 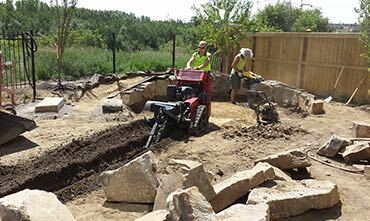 Stackable Natural Stone Boulders bring your hardscaping to life. 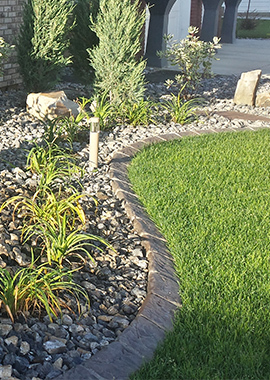 The weathered, natural look of the stone will compliment any yard or design. 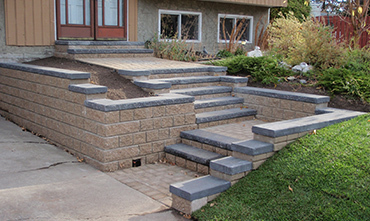 Natural Stone Steps are perfect for those difficult elevations particularly along the sides of homes and around walkout basements. Solid and heavy they won’t move! The soothing sound of running water is calling. 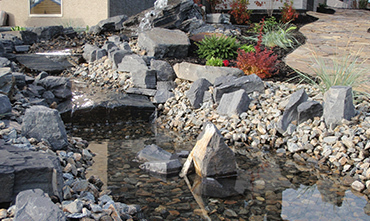 Let a waterfall and pond become the center of your living space. 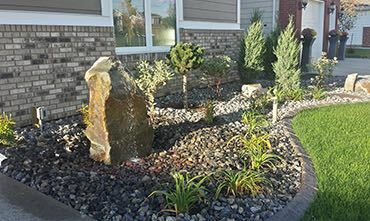 Install a rock bubbler to add that extra touch to your front yard or that back corner you’re not quite sure what to do with! 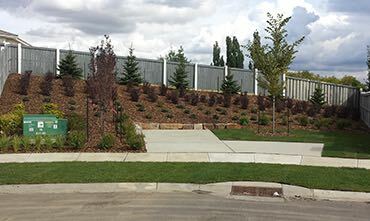 SRW Retaining Wall offer great strength and practical usages. All our walls are reinforced and there are many choices in texture, shape and color. Perhaps a grand entrance way to your home finished in stone? Think of a design and we can build it! 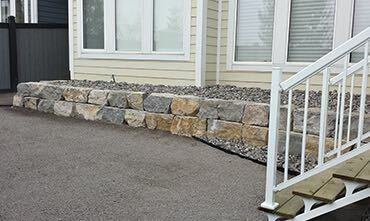 NStack Stone and other non-load bearing block are perfect small garden walls. 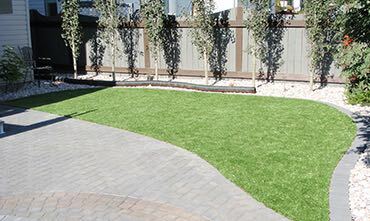 Adding some vertical height into a flat yard can give it that finishing touch! 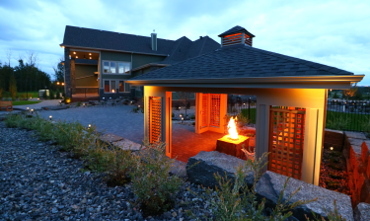 Relax and enjoy the warmth and comfort of your very own firepit. Who’s got the hotdogs and marshmallows?? Tired of cracking concrete and the grey look? 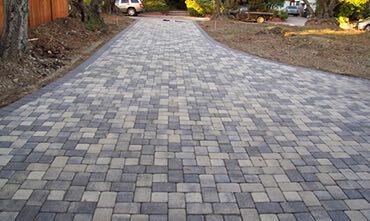 Let us construct the eye catching look of an all stone driveway. 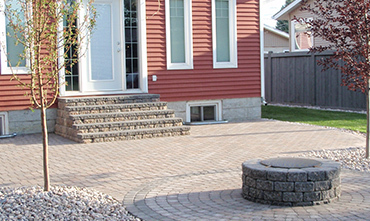 Let your outdoor living space come alive with the look of paving stone, cobblestone and circle kits. Endless colour, texture and patterns! 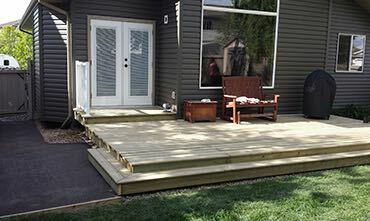 Make your deck a key part of your entertaining area and living space. Maintenance Free Pressure Treated or Composite products available. 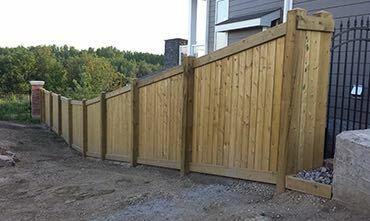 Maintenance Free Pressure Treated or Stained Spruce Wooden Fencing in a variety of styles. 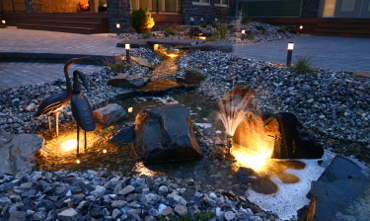 Low Voltage Garden Lighting to accent your project. 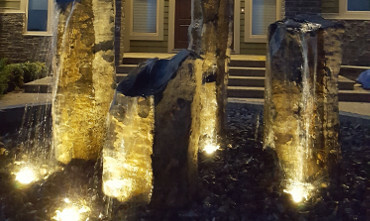 Trees, Water Feature and Pathway lighting will make your yard look amazing! 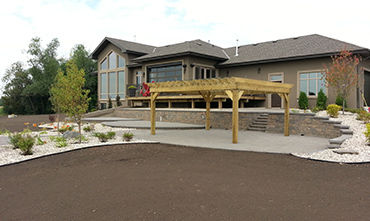 We can finish Final Grading with Approval before your landscaping project is started. Topsoil is in a consolidated yet workable state. 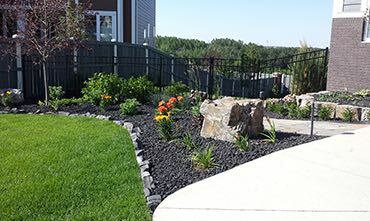 Let an Automated Irrigation system take care of your watering requirements for the summer. Your garden will love you for it! 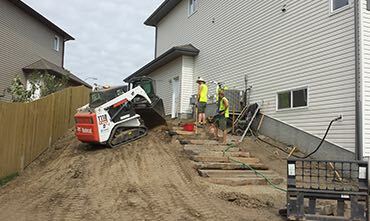 Let our Track Loaders take the hard work out of back breaking labour. We have a variety of attachments for every project. 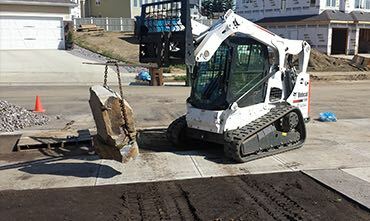 Our compact Excavators can dig, lift and place material with ease. Precision is the benefit of these versatile machines. 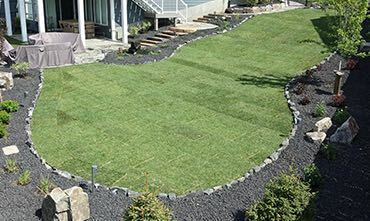 From a small yard to acreage size, we can professionally install your new high quality Kentucky Blue Turf Grass for instant results. Let our specialised equipment mechanically install mature large trees up to 3.5" (90mm) calliper. 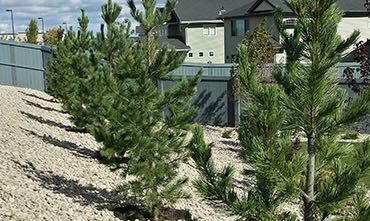 We can select and professionally plant the most appropriate flora to suit your location and landscaping project. The ultimate in maintenance free! 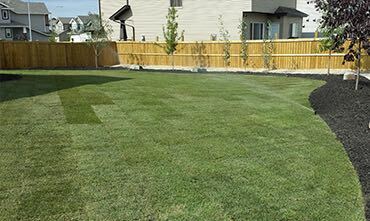 Never worry about mowing or watering again! Who gets bragging rights at the family bbq? It’s fun for the whole family! 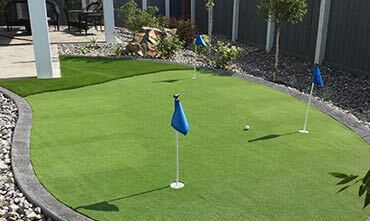 The finishing touch to your lawn area. Available in countless colour shades and finishes. 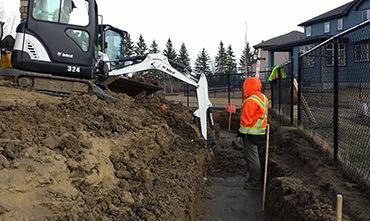 Electrical and Gas Lines trenched to correct depth and to code. Proper compacted backfilling is the key! Safety is paramount but looks are too. 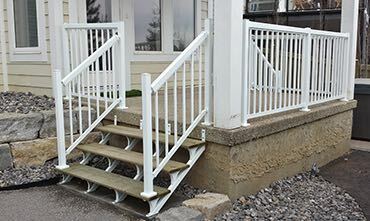 We can install railings and steps that will work with any project!